Emily Blake holds a Bachelor of Science in journalism from the University of Florida. She currently lives in Seattle, where she interns for the "Seattle Times." Blake worked at "The New York Times" through the Dow Jones News Fund in 2010. She was awarded the Society of Professional Journalists Award by UF’s College of Journalism and Communications. The never-ending fight against weight gain sometimes seems like a lost battle. One minute you're devastating the competition -- eating healthy and fighting off junk-food cravings. The next, you're back on the ropes, muttering to yourself, "I can't believe I ate the whole thing." For some, it's emotions and circumstances that can wreak havoc on a diet, whether it's a breakup, stress or pure boredom. For others, it's a never-ending cycle of new diets that promise results too good to be true and abs that look airbrushed. No matter what trap you find yourself in, there's always a way out. The goal is not to plan what you eat; the goal is to have a variety of healthy foods and snacks. If the words "emotional eating" bring to mind an image of a disheveled Bridget Jones toting a pint of Ben & Jerry’s, think again. Emotional eating is not just inhaling spoonful after spoonful of Cherry Garcia between post-breakup sobs. In reality, 95 percent of eating is emotional, says Beth Castle, an emotional eating expert in Alberta, Canada. And when emotions such as stress, grief or boredom lure you into the kitchen, you're stuck in a suffocating weight trap. "When people are looking for comfort, it’s easy to turn to food," she says. “In that moment, it makes them feel better.” But as soon as you finish that slice or two or three of molten chocolate lava cake, you feel even worse than you did before. The very thing that was supposed to relieve your distress makes it even worse -- sparking a vicious cycle that ends in extra pounds. "We need to find something to fulfill our needs other than food," Castle says, emphasizing that social interaction is key and that laughing is often the best comfort. Sometimes, just going for a walk outside can help take your mind off food’s temptations. 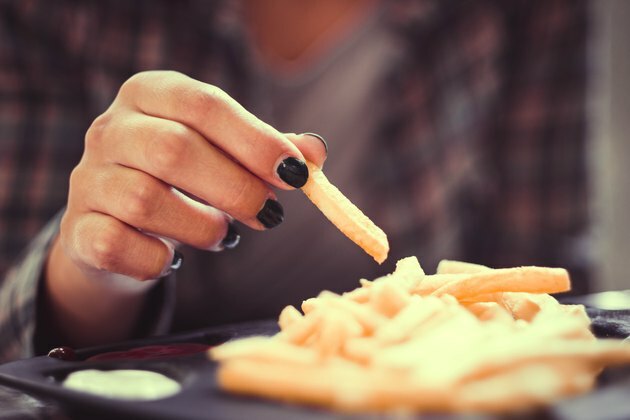 The most important thing to do when you fall victim to emotional binging is to forgive yourself, says Kathie Mattison, an eating disorders therapist in Rockford, Illinois. Punishing yourself for falling off the weight-loss wagon will only make the struggle worse. The moment you forgive yourself is the moment you can start taking steps to improve your relationship with food, she says. Sometimes, it’s nearly impossible to overcome emotional eating alone. If you think you may be depressed, or if your stress starts to take over your life, Mattison says the best thing to do is see a therapist or doctor. "Finish your peas." On the surface, it’s a simple request your parents might have made every night at dinner. But underneath, it reflects a portion problem, and it can be one of the hardest habits to overcome. 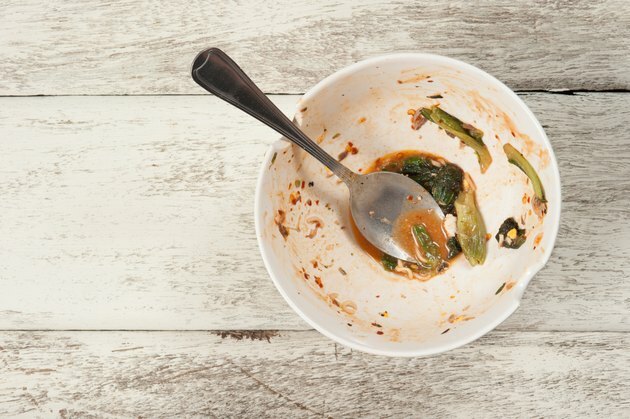 The Clean Plate Club has its roots in a World War I campaign by President Woodrow Wilson to ensure the country’s food didn’t go to waste. Kids were asked to sign a pledge: "At table, I’ll not leave a scrap of food upon my plate. And I’ll not eat between meals, but for suppertime I’ll wait." Almost a century later, many are still devoted members. Though the U.S. supply of food is far from scarce, many Americans still find themselves adhering to the traditional three-meals-a-day schedule. If you limit yourself to a certain number of meals a day, Castle says you're more likely to overeat. When you save your appetite for dinner, you'll probably finish that calorie-packed plate of lasagna even if you don't need it. Castle recommends eating several smaller meals instead of carving your day around breakfast, lunch and dinner. "The goal is not to plan what you eat; the goal is to have a variety of healthy foods and snacks," she says. Notorious for their never-ending bowls of pasta, restaurants are one of the most delicious foes in the portion-control fight. If you have trouble putting down the fork when dining out, Castle suggests sharing meals or ordering from the kids’ menu. You might skip breakfast, cut out carbs or even survive a week solely on cayenne pepper and molasses. Skipping meals or cutting out food groups -- techniques promised to help "drop five pounds in a week" or "banish belly fat" -- can leave your blood sugar imbalanced and your appetite unsatisfied. "By ignoring our bodies’ signals of hunger and fullness, food is disconnected from the body’s needs," Mattison said. And when you finally respond to your need to eat, you're more likely to lose control. These habits can make you susceptible to two of the most common traps: the diet-and-binge cycle and nighttime eating. “If we skip meals, graze, keep going with caffeine throughout the day, at night we’ll be hungry, fatigued and craving food satisfaction,” Mattison says. The key to avoiding both of these traps is not skipping meals and making sure you don’t go hungry throughout the day. "The afternoon snack is key to making better decisions at night," Castle says, adding that a piece of fruit or a cup of coffee won’t cut it. She suggests having some carbs, whole grains and protein. "By the time 5 o’clock hits, we’re more likely to make better decisions about what we’re having that night." 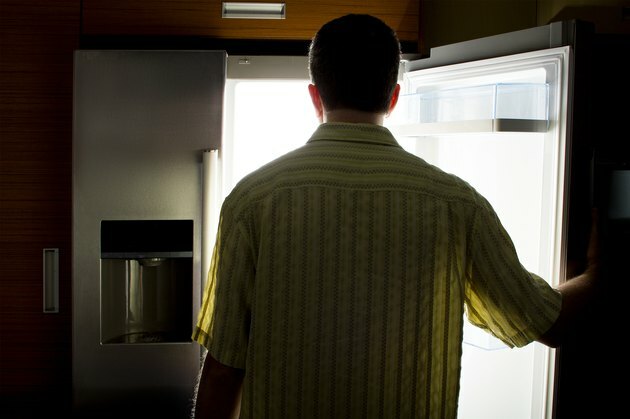 If left untreated, a bad habit of nighttime eating can morph into a full-blown disorder called night eating syndrome. Commonly misdiagnosed, the disorder affects as many people as the more widely known eating disorders such as anorexia and bulimia, says Albert Stunkard, M.D., a psychiatry professor at the University of Pennsylvania who first identified the disorder more than 50 years ago. Signs of night eating syndrome include not feeling hungry in the morning, difficulty falling asleep, waking up in the middle of the night to eat and a depression that intensifies through the day, hitting hardest after 8 p.m. The strongest determinant of the disorder, Stunkard says, is family history. If you think you may have NES, Stunkard recommends seeing a physician immediately.